These taps arrived on time and look great. It does include a pop-up waste despite what it says in the Q&A above which makes them even better value for money. The tap tops are a bit plain with just an H and a C, but as long as you can tell which is hot and which is cold, not really an issue. Well worth the money. Had this fitted today and it works brilliantly.My only disappointment is the H for hot and C for Cold on the top of the taps. Looks a bit plain as previously had this plus the make on the White top of the taps. Plug works great and flow is good Pleased and great value for money. Seen similar for more money and not as nice. I bought this tap after comparing it against two other expensive but strikingly similar looking taps.. 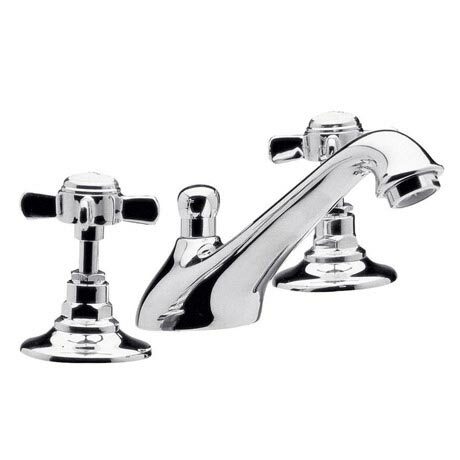 Although these were inexpensive, the quality is second to none and I'm glad I didnt pay in the hundreds for taps that look the same.